Rice and Crab Dip appetizer made with canned wild-caught crab meat, mayo, cream cheese, lemon zest and juice, green onion, spices and tender cooked organic rice. This post is sponsored by Mahatma Rice. All opinions are mine alone. When you think of creamy dips, including rice may not first come to mind. However, after trying it with this Creamy Rice and Crab Dip appetizer, I can say it should be a lot more common. While technically an appetizer, it can also be a great snack or even a light meal. With March related Madness happening (basketball for those who don’t watch), there’s always a need for unique appetizer recipes. 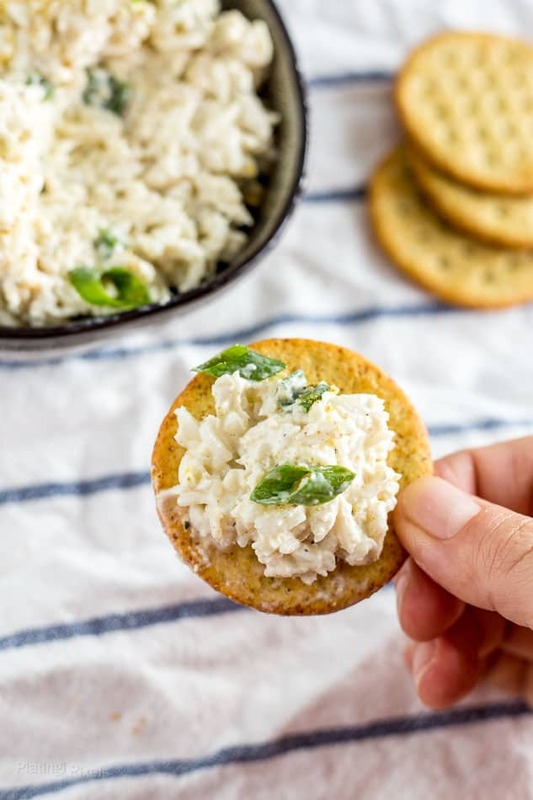 Dips are always a hit at gatherings and this Creamy Rice and Crab Dip appetizer will surely impress your guests. The combination of this rich, creamy, and tangy seafood mixture paired with tender rice is a joy to the palate. Rice also contains complex carbs and is loaded with fiber. Mahatma Organic White Rice cooks perfectly and is full of flavor. I cooked the rice ahead of time with just a bit of salt and butter. After a far share of snacking on it, I had to remind myself to save some for this Creamy Rice and Crab Dip recipe. Riviana Foods is America’s leading rice company and the nation’s second largest provider of pasta products. Their portfolio includes over 20 trusted brands with more than 500 distributed products in many countries around the world. Even if the name doesn’t sound familiar, you probably grew up loving their many brands. 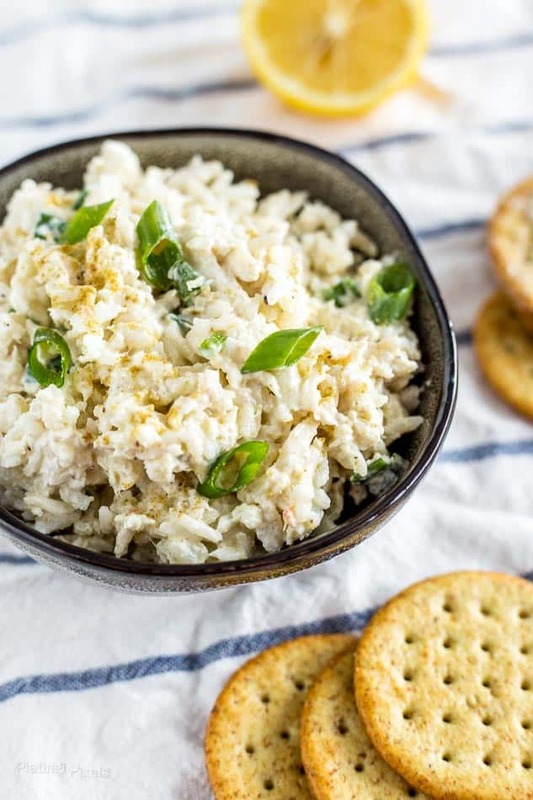 This Creamy Rice and Crab Dip appetizer is simply a mixture of canned wild-caught crab meat, organic mayo, cream cheese, lemon zest and juice, green onion, spices and tender cooked organic rice. Serve warm or chilled with crackers, bread or veggies. You can even wrap it in seaweed sheets for easy homemade crab rolls. However you serve it, this Creamy Rice and Crab Dip will be an impressive addition to your appetizer menu. 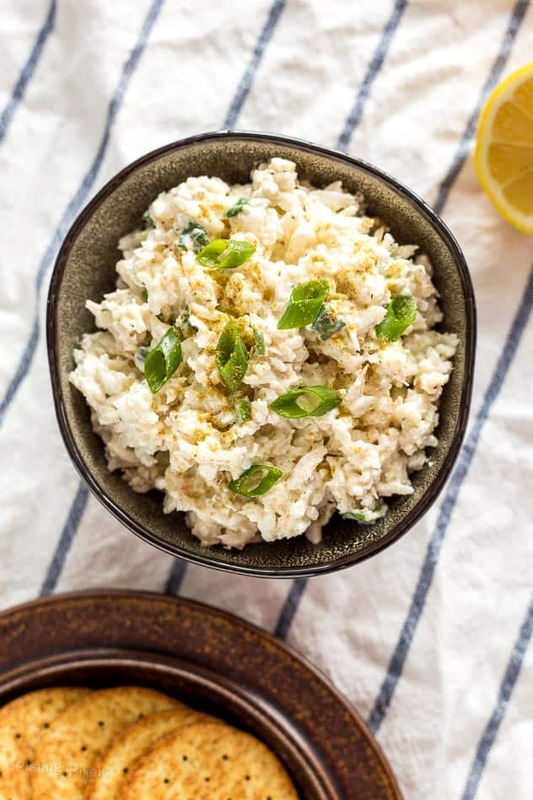 Creamy Rice and Crab Dip made with canned crab meat, mayo, cream cheese, lemon zest and juice, green onion, spices and tender cooked organic rice. Cook rice according to packing directions, adding butter and salt to pan. Do not overcook, slightly tender is preferred. Remove from heat and set aside. In a large bowl, stir together remaining ingredients until well combined. Gently fold in cooled rice if serving cold. Serve with crackers, bread, veggies, or in seaweed wraps. To serve warm: Bake crab mixture in oven-safe dish at 375° F. for 20 minutes, or until warm. Fold in rice and serve.